As seen on: Discovery Channel, Animal Planet and BBC! The Greatest White Shark Dive Welcome to Guadalupe, the greatest location in the world to dive with great white sharks, and your gateway to an incredible shark diving adventure. The world's biggest white sharks Guadalupe is home to the worlds biggest, most awe-inspiring great white sharks - and we're ready to take you right into their natural habitat! Incredible water clarity The amazing conditions in Guadalupe have made it a favourite shark diving destination of scuba divers and shark lovers across the globe. As seen on Shark Week The Shark Diving Xperts team have been featured on a wide variety of shark documentaries and TV shows, including Discovery Channels' 'Shark Week'. Shark diving in Guadalupe So what are you waiting for? 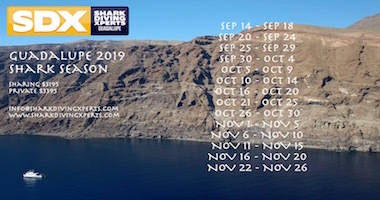 Contact Shark Diving Xperts today to book your incredible great white shark diving trip in Guadalupe! Guadalupe boasts some of the BIGGEST great white sharks in the world. We are passionate about sharks and highly experienced in our work. We support ongoing great white shark research and conservation. Start your shark diving adventure today! Great Shark Diving in Guadalupe -Read our Facebook reviews! 100% Safety record - Thanks to our expert crew! 100% Success Rate - We've seen sharks on every single one of our diving trips! Ethical Tourism - We treat these incredible animals with the respect they deserve! Making a difference - We also lead shark research and conservation studies in Guadalupe!